Law Office of Joshua Pops, P.L.L.C. 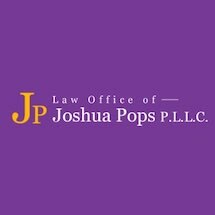 Welcome to the website of the Law Office Joshua of Pops, P.L.L.C. I am a lawyer in Vancouver and hope I can help you as your Vancouver divorce lawyer or Vancouver family law attorney. I am here whether you need someone to show you how to obtain or change child custody, how to adopt a child, how to change or adjust child support, or how to divide the property when you split up. I want to be the Vancouver divorce lawyer that you can trust in difficult times. I understand that divorce can be about the most difficult thing a person can go through, and as a divorce lawyer I want to make the legal aspects of it as smooth as possible for you and your family. I want to help take the guesswork out of child support and answer your custody questions, and help you to figure out whether you can solve your differences or whether things will get heated splitting the property. I chose the phrase "a lawyer for when your life changes" for just that reason. I know that getting divorced is not just about changing legal status, it is a change in your life. It requires a lawyer who understands the stresses that you are going through and understands what is at stake: kids, a house, assets, a whole lifetime in some cases. I am happy to represent clients all over southern Washington. I am not just a Vancouver divorce attorney but also consider myself a Cowlitz County divorce attorney and a Skamania County divorce attorney. From Amboy to Yacolt, Battle Ground to White Salmon, I am there. Feel free to contact me via email on the "contact us" page, or if the matter is pressing call me at (360)567-8486 to set up an appointment to speak with me at my office right off of East Mill Plain Blvd. I look forward to the opportunity to discuss your Washington divorce law problem and hopefully be your Vancouver divorce attorney.